In computing, virtual memory is a memory management technique that provides an "idealized abstraction of the storage resources that are actually available on a given machine" which "creates the illusion to users of a very large memory." The computer's operating system, using a combination of hardware and software, maps memory addresses used by a program, called virtual addresses, into physical addresses in computer memory. Step 1: Go to Start Menu and click on Settings. Step 2: Now type performance on search bar and select Adjust the appearance and performance of Windows. Step 3: A new Window will open before you. Go to Advanced tab in it. 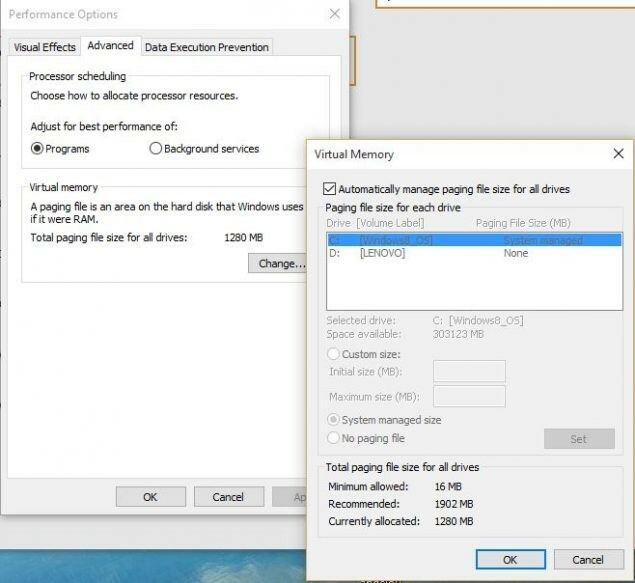 Step 5: If the current setting is considerably less than the recommended, unselect the Automatically manage paging file size for all drives box on this window and click on Custom size. Step 7: Click on OK to save the changes.